Appearance: This pretty IPA poured a deep amber with bright golden highlights and a good amount of haze. The mountainous off-white head was at least 3 fingers tall and lasted nearly the entire beer leaving behind incredible lacing. Smell: Mmmmm. Scent starts off slightly sweet with toasted grains and caramel malt but the pungent aroma of citrus and pine hops swarms the senses and gets your mouth watering. Smell is an amazing mixture of sweet and hoppy with very little alcohol esters. Very nice. Initial Taste: Now that’s an IPA! Big sharp hops slice through your taste buds with a pine resin, grapefruit citrus bitterness. But don’t fear, there is a sweetness of toasted, caramel, bready malts that cuts down the bitterness perfectly. The finish is what you would expect from such a complex IPA; an oily, floral, hop pungency that leaves your mouth watering for the next sip. And even though its a 7.3% abv there is little to no alcohol esters to be found. Thoughts: If I had to taste this blindfolded I would have guessed this was an Imperial/Double IPA. 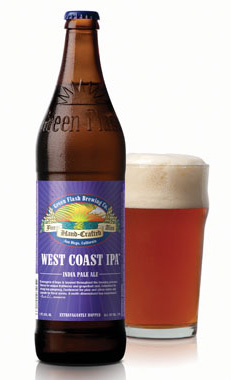 It seems the East Coast brewers could learn a thing or two from this West Coast IPA. This is a beer that leaves a hop-head with nothing to be desired. Even their website warns of the impending hop that awaits the drinker – “A menagerie of hops is layered throughout the brewing process: Simcoe for unique fruitiness and grapefruit zest, Columbus for strong hop pungency, Centennial for pine and citrus notes and Cascade for floral aroma. A multi-dimensional hop experience.”. If that doesn’t scream West Coast IPA nothing does. This monster is not just hoppy though, it’s really well balanced with malts and soft wheat-like grains. It’s no surprise this IPA has been winning awards since 2005! If your a hop-head like me then do yourself a favor and check out this beer. It’s just recently become available nationwide so you should be able to find it at your local beer hotspot. Cheers everyone! Now that's an IPA! Big sharp hops slice through your taste buds with a pine resin, grapefruit citrus bitterness. But don't fear, there is a sweetness of toasted, caramel, bready malts that cuts down the bitterness perfectly. The finish is what you would expect from such a complex IPA; an oily, floral, hop pungency that leaves your mouth watering for the next sip. And even though its a 7.3% abv there is little to no alcohol esters to be found. Summary : This is a must try! Next: Fat Tire! To match the spare tire.